Electronics company ALPS tests (and manufactures) all kinds of things. But its virtual cup, made possible by haptic technology and heat transmission, is the electronics manufacturer at its weird best. The cup, which is the size of a typical tumbler, is able to transmit a material’s tensile strength and even the temperature of your beverage of choosing. That is, as long as it’s cold water in a plastic cup or hot tea in a mug. As you tilt it, you feel the weight of the cup shift, and hear the water slosh around. As Engadget’s Deputy Tea Editor, I can confirm that the effect is… freaky. 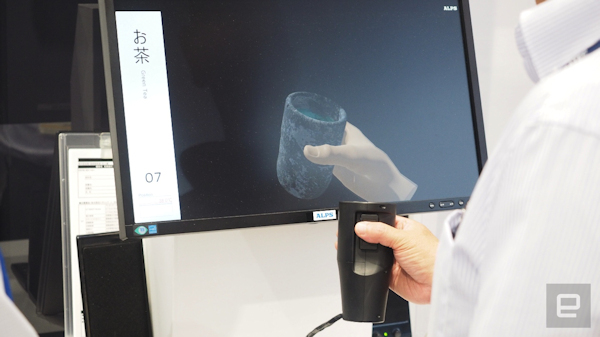 The sensors also push back depending on the virtual material the cup is meant to be made of. With a plastic cup, it “squished” like it was meant to. Again: It’s weird. Sure, no businesses are looking to deliver the experience of a digitally replicated cup of tea; it’s a demonstration of the kind of analogue sensations the company can deliver through technology. ALPS also had a haptic pad that was able to replicate tile and (for some reason) denim. Other surfaces, naturally, can also be programmed too. The technology delivers a similar tactile sensation with motors as your finger runs across it. The cup delivers a more uncanny experience — it’ll be exciting to see where the company takes it next.